Rossway is located near the base of Digby Neck. It boasts a spectacular view of St. Mary's Bay full of water at high tide and at low tide great portions of the sea floor are exposed. 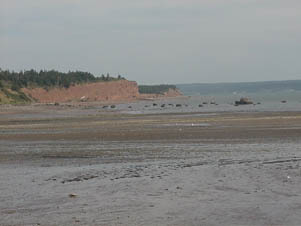 The bay seen from Rossway is lent a reddish tint due to the shallow water covering the red mud sea floor. 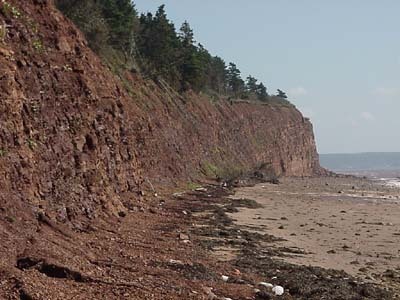 The spectacular cliff called Seawall is the result of relentless tidal erosion. Its face reveals the strata of millennia past and was recently the site of an archaeological exploration for fossils. The beach below the cliff presents an ideal spot to take a summer dip in the surprisingly warm waters of St. Mary's Bay. 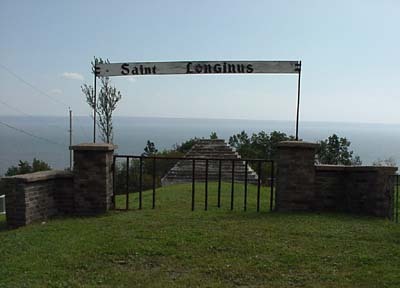 This is a picture of St. Longinus cemetery from up on North Mountain around Rossway. From here you can get a great view of the head of the tide in St. Mary's Bay.